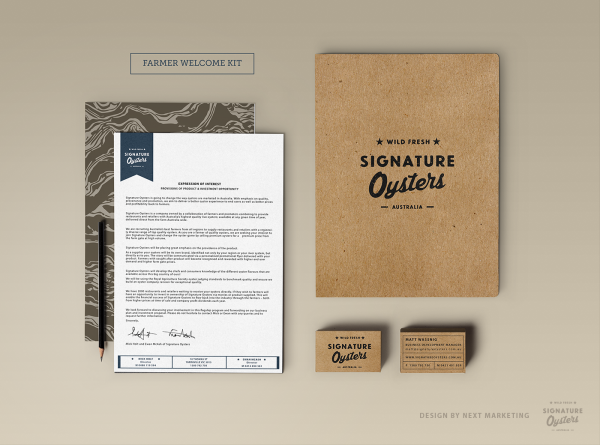 Early in 2015, Next Marketing teamed up with oyster wholesaler Signature Oysters to launch their new brand. Signature Oysters is challenging and changing the way that oysters are marketed in Australia through sending profits back to the farmers. Signature Oysters have a unique business model that brings together the best oyster farmers from all the growing regions around Australia and forms a single point of contact for hotels, bars and restaurants. Hospitality venues that want to serve premium oysters all year round have in the past found it difficult to get a consistent supply of high quality oysters through the traditional / volume wholesale model. As well as convenience, Signature Oysters has a strong emphasis on quality. Signature Oysters are judged to the Royal Agriculture Society’s standards meaning that only the freshest and finest are used. 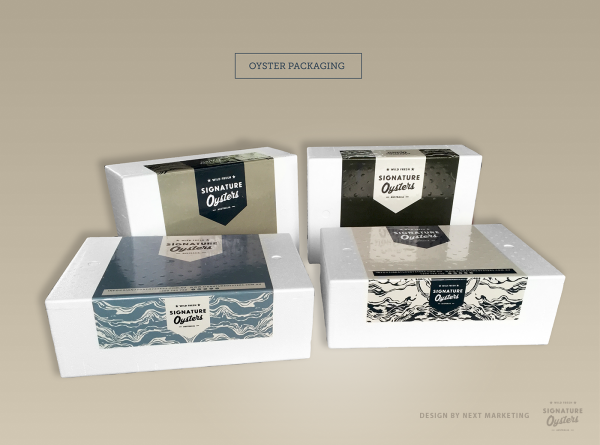 By bringing quality oysters direct from the farm to the plate and sending profits back to farmers, Signature Oysters has challenged the industry status quo, and is revolutionising the seafood industry through great design and marketing. 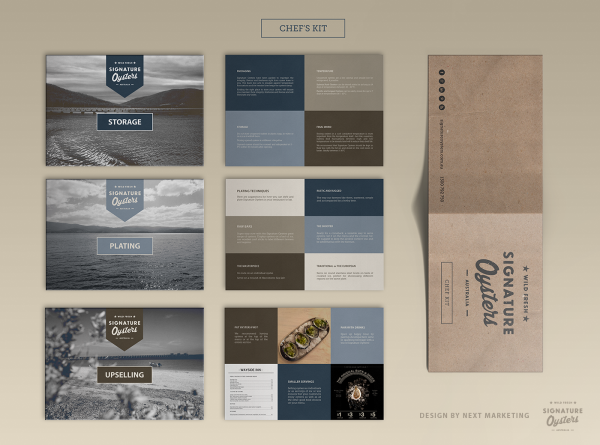 There were a number of critical factors to consider for the launch of the Signature Oysters brand. •	The need to create a premium, high end, high quality brand while keeping the rustic, down to earth feel of the oyster farmers. 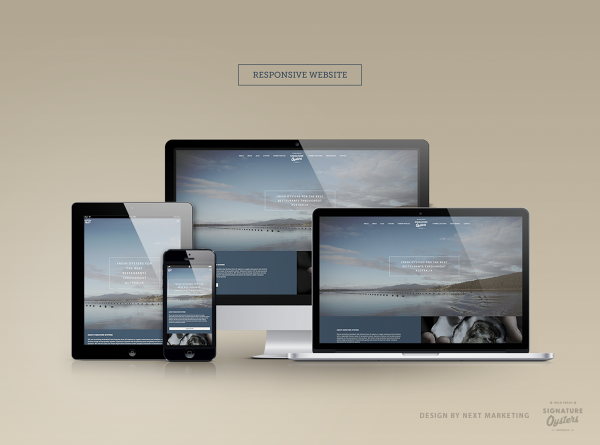 •	Encapsulating the essence of the brand, which focuses on provenance, exceptional quality and branding. •	Keeping the buyers connected with the farmers through giving the individual farmers a presence throughout the branding. Because of Signature Oysters’ target market (high end, premium hotels, bars and restaurants), the business needed to be positioned in a way that would appeal to a highly discerning group of clients without losing the country, provincial feeling of the farms. 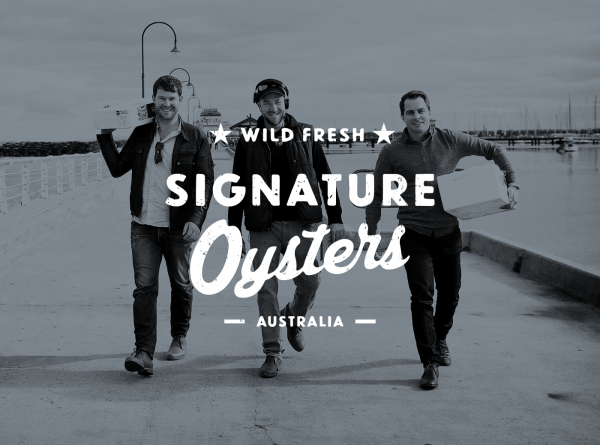 In the months since its launch, Signature Oysters has successfully disrupted the seafood wholesale industry in Melbourne and created a unique brand that combines the down to earth feel of the farmers with the premium nature of the Signature Oysters product and target market. 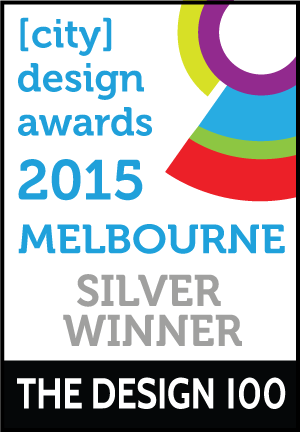 Key competitors are following Signature Oysters on platforms such as Facebook and are engaging (liking) the content that Next Marketing posts on behalf of Signature Oysters.The authenticity and credibility of the branding has captured the hearts and minds of some of Melbourne’s most respected restaurants. While there are a number of other seafood wholesalers in Melbourne, most of them have placed very little emphasis on their branding or online presence. 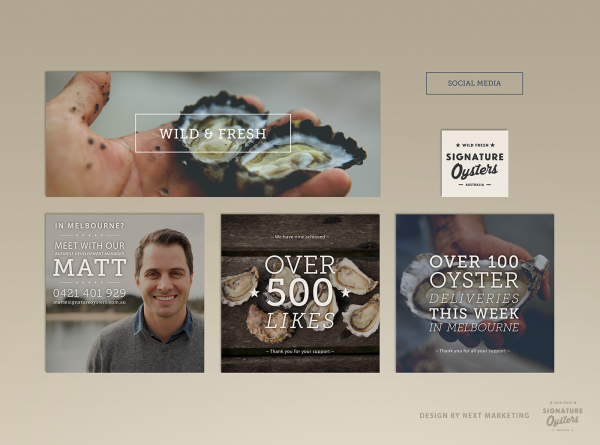 By creating a strong online presence and visual brand, Next Marketing was able to differentiate Signature Oysters from the rest of the market and change the way oysters are marketed in Australia. 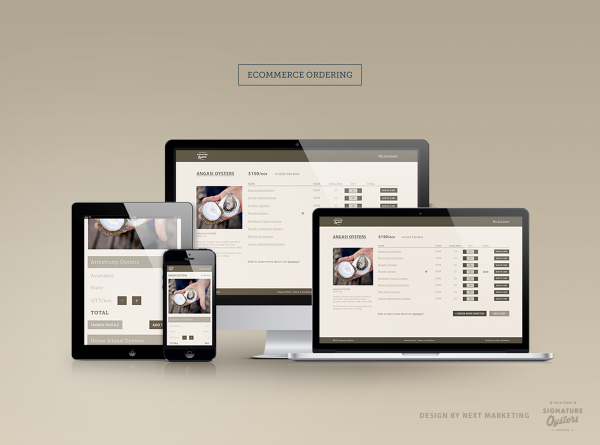 Unlike their competitors, Signature Oysters uses no stock photography. Instead Next Marketing sent out a photographer to all the oyster farms to photograph the farmers in their natural setting. 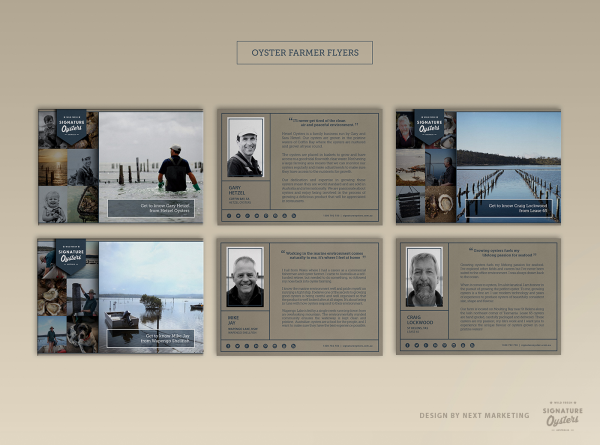 These photographs form the basis of all the Signature Oysters branding, putting the farmers front and centre, ensuring the connection between the producers and the end product is maintained. 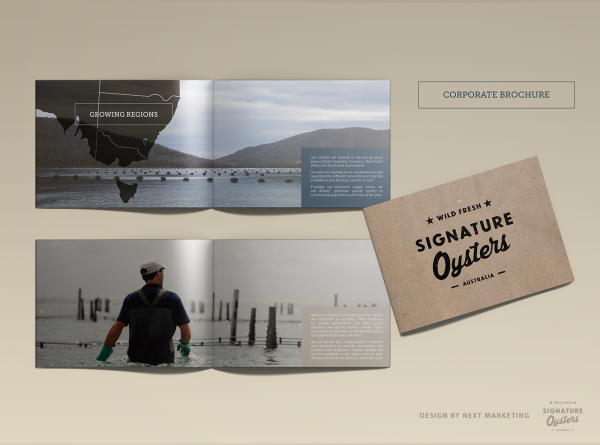 Part of the challenge for Signature Oysters was creating a multi-disciplinary brand and maintaining consistency across the many platforms from print to digital media. To overcome this challenge, Next Marketing put the farmers front and centre of all the branding. Another challenge was to create a country, provincial feel to the Signature Oysters brand while also exuding quality and a premium feel. The foundation of Signature Oysters’ brand identity is their unique colour scheme, which includes an interesting range of light to dark colours, adding flexibility into the brand elements. This colour scheme was inspired by the oysters’ natural habitat of slow moving estuaries and designed to evoke the feeling of stepping into a cold calm river in the morning, and watching the silt rise around your feet. The second important element is the oyster pattern that resembles an oyster shell and sandy waves to signify the farmers’ connection with the sea. Contrasting typefaces were used to emphasis the fusion between refined restaurant and wild nature. Lastly, printing the marketing materials on recycled craft paper gave them an earthy yet high quality feel. The Signature Oysters launch has exceeded everyone’s expectations and the branding in particular received great feedback from restaurants and chefs. 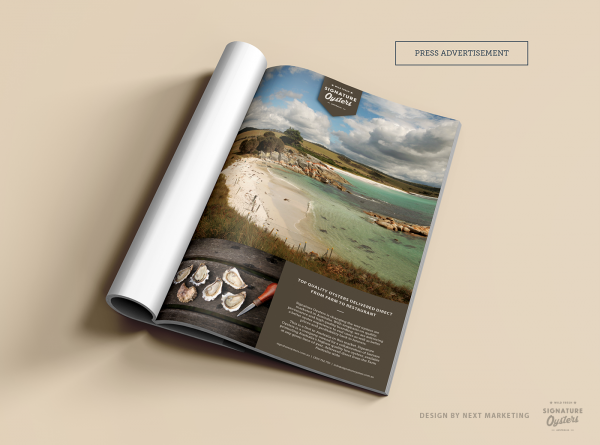 From a marketing perspective, the Signature Oysters Facebook page achieved 500 likes in 8 weeks (with very strong engagement – many posts with 200+ reach), and the branding is opening doors and getting noticed. From a sales perspective, Melbourne chefs are ordering and re-ordering and restaurants such as Donovan’s and Pei Modern are regular clients. The second city launch is in motion for Spring.